Galen E. Parkinson, 89, passed away peacefully, Wednesday, March 6, 2019, at Azura Memory Care, Wausau. He was born August 17, 1929, in Owen, the son of the late Oscar and Emaline (Scherf) Parkinson. He married Beverly Stensberg on June 27, 1953, in Mosinee. She survives. Parky was a graduate of Owen High School where he was quarterback of the football team and valedictorian. He was Sergeant in the US Army and served as a Communications Specialist during the Korean War. He later earned his Bachelor’s and Master’s degree in Conservation and Biology from the University of Wisconsin, Stevens Point. Parky taught Biology, Driver’s Ed, and Hunter’s Safety at Mosinee High School. Many students remember him as their favorite teacher. Parky was a devoted husband, loving father and grandfather, and a cherished friend to many in the Mosinee community. He will be remembered for those characteristics as well as his wonderful sense of humor and an uncanny knack for storytelling and jokes. 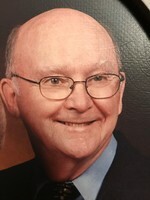 Parky regularly attended Mosinee United Methodist Church, and was active in church committees throughout his life. His was an avid fisherman and sportsman, and took great joy in teaching his children to enjoy and respect nature. Survivors, besides his wife, Beverly, include a son, Jim Parkinson, Mosinee, a daughter, Gail (Chuck) Wirsbinski, Mosinee; and two grandchildren, Evan (Phil) Sorenson and Isaac Wirsbinski, both of Madison. He is also survived by dear relatives and best friends, Donna and Tom Mitchell, of Sussex, Wi. He was preceded in death by a son, Jeffrey Parkinson. Memorial Services will be at 11:00 a.m., Saturday, March 23, 2019, at Mosinee United Methodist Church, followed by lunch at Pinewood Supper Club, Mosinee. The Rev. Gail Ray will officiate. The family will receive friends from 10:15 a.m. Saturday until the time of services at the church. Donations will be shared between Mosinee United Methodist Church and a conservation/wildlife charity to be determined. Beste Funeral Home, Mosinee, assisted family with arrangements. Online condolences can be made at www.bestefh.com. To send flowers to the family of Galen Ellsworth "Parky" Parkinson, please visit our Heartfelt Sympathies Store.